One of the highest-profile hate crimes in the nation to occur in recent years involved the unprovoked massacre of a historic South Carolina church carried out by Dylann Roof. Shortly, thereafter, there was the largest mass shooting in American history that occurred in Orlando at a gay night club. These terrible incidents opened up the flood gates for a national dialogue on the real prevalence and impact of hate crimes in the nation. 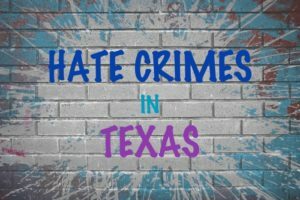 In the state of Texas, hate crimes are no less of an issue than any other area of the nation, and their investigation remains a top priority for investigators and social interest groups working against them. The available statistics on hate crime frequency in Texas illustrate the ongoing need for officials to continue their heavy investment of effort in working against discrimination-motivated victimization based on race, religion, gender, sexual orientation, and all other personal identifiers. defendant intentionally selected the person against whom the offense was committed or intentionally selected property damaged or affected as a result of the offense because of the defendant’s bias or prejudice against a group identified by race, color, disability, religion, national origin or ancestry, age, gender, or sexual preference. Out of all the FBI Civil Rights program’s priorities, hate crimes are the highest on the program’s list. The FBI considers those who perpetuate and preach intolerance and hatred to be catalysts for terrorism, and the Bureau treats them as such. The Texas Hate Crimes Act, recorded in Chapter 411.046 of the Texas Government Code, categorizes any crimes that are perceivably motivated by “prejudice, hatred, or advocacy of violence” as hate crimes. Like the FBI’s classification determiners, these crimes are linked to any prejudices directed at gender, gender identity, religion, disability, race, ethnicity, sexual orientation, disability and religion. The following statistics collected by the Texas Department of Public Safety are the most recent available for comprehensive insight into hate crime prevalence, locations, offenders, victims and offenses in the state of Texas. What is the Penalty for a Hate Crime Offense in Texas? The Texas DPS reported that there were 166 reports of hate crimes in 2014. The hate crimes involved 198 offenders and 190 victims. The most common bias was race and ethnicity, the second most common bias was sexual orientation, and the third most common bias was religiously-motivated. The 2014 figure on hate crime reports was a 23 percent increase from the 2013 figure. The DPS reported that hate crimes most commonly occurred in residential homes, at 30.4 percent. Next to residences, the second-most frequent places for hate crimes to occur were roads/highways/streets/alleys, at 16.1 percent. The third most frequent areas for hate crimes to occur were parking lots and garages, at 12.5 percent. The DPS hate crime report’s data on offenders showed that the 198 hate crime offenders were 67.7 percent white, 18.7 percent black, 1.5 percent Asian, 1.0 percent multiracial, and 11.1 percent unknown. The information on Texas hate crime offender demographics was analyzed with the understanding that hate crimes can be perpetuated by different offenders sharing the same race. The DPS report’s data on hate crime victims categorized the victims based on the following categories: individual, business, financial institution, government, religious organization, society/public, “other”, and unknown. Individuals were the most frequent victim type, at 84.2 percent. The second most frequent victim type was “business”, at 8.4 percent, followed by government and religious victims at 3.2 percent. The most common type of hate crime offense was simple assault, at 15 percent. The second most frequent hate crime offense was vandalism, at 25.7 percent, followed by intimidation at 18.6 percent. The FBI has historically investigated hate crimes in which the offending party was motivated by the national origin, religion, or ethnicity of the victim. The role of the FBI in hate crime investigation was notably increased after the Civil Rights Act of 1964. In the past, investigators were restricted to cases in which the victim of a hate crime was engaging in an activity under federal protection. After the 2009 Hate Crimes Prevention Act of 2009, investigators gained a freedom to investigate hate crimes without as much red tape. In addition, the 2009 act also gave investigators clearance to freely investigate hate crimes committed out of a bias against the sexual orientation, gender, disability or gender identity of the victim. Though the time and manpower investment in hate crime investigation remains heavy, the need for vigilance remains high. According to the FBI’s 2015 report, there were 5,479 hate crime incidents nationwide in 2014; these incidents involved 6,418 offenses to the Uniform Crime Reporting (UCR) program, creating 6,727 victims nationwide. Though the figure was down from the 2013 rate, in which there were 5,928 incidents and 6,933 offenses, the issue remains a top priority for investigators in Texas and the nation at large all year round.